Studied in Amsterdam at the State Academy of Fine Arts and specialized in copper engraving. In 1936 he joined Joh. Enschedé en Zonen as an apprentice engraver. In later years he would become the firm’s Art Director. Enschedé could make good use of Hartz’s engraving skills for the banknotes and stamps commissioned by clients from around the world. For the stamps he joined forces with the book and type designer Jan van Krimpen who provided the lettering. 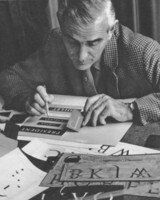 Hartz designed a bookface for Enschedé (Emergo, 1949, never released) and one for Linotype (Juliana, 1958).